Big, bright, and bold! This is hand painted glazed ceramic made by Oneida china. 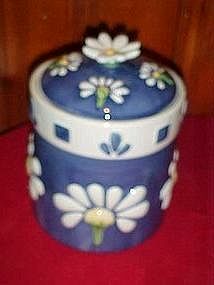 Dark blue with large white daisy pattern. Daisy on the top makes it complete. Measures 9 1/2" tall and is large and roomy for retrieving those cookie treats! Freshness gasket inside the lid makes it airtight for longer storage. Wonderful condition! !